I guess I've always been the type of person who likes collecting things, perhaps a bit too much for his own good. Case in point I reinstalled Leopard on my MacBook Pro this evening so I could reformat the drive as case sensitive. As I was about to copy over my iTunes music library from one of my backup drives I noticed big the folder was, and how huge the Podcast folder had become! I guess I've been downloading and listening to podcasts since early 2005, and they do build up! The question is though, what do I do with all of them? Some of the shows in this folder are no longer being produced or are even available anymore I think, and it'd be a shame to delete this collection after downloading for so long. In a nostalgic way it's fun to listen back to old shows to see what people thought was exciting a few years ago. 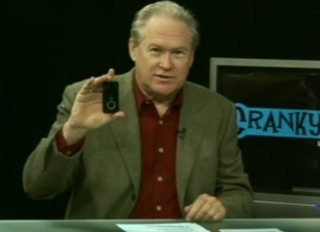 Look, it's an iPod that plays video! Google will never buy YouTube! Ants on Mars! Irn-Bru in New York! 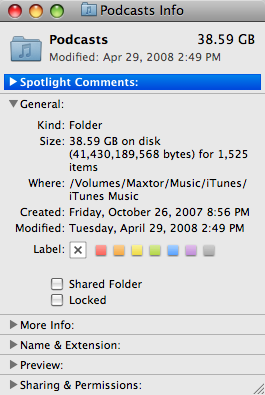 It also raises another question: if I don't delete this folder, how large will it be in 2009? 2010? 2020? Will I need to contemplate buying even more terabyte hard drives or invest in a Blu-Ray burner and stacks of double sided discs just for this stuff? So much for podcasts being free right? :-).